So your physique isn’t as lean as you would like it to be and you want to lose some body fat. Sometimes getting rid of unsightly body fat can be a complex problem and you can’t come at it from just one angle. The body constantly adapts to changes in one or two metabolic pathways. AdaptoLean works in a number of ways to mobilize fat from fat cells. Our scientific combination of Garcinia Cambogia, Caffeine, Cayenne Pepper and Green Tea have been clinically proven to ensure fat cells are eliminated, as both metabolic and fat oxidation rates are increased. If this combination was not already potent enough, there are a further eight ingredients included in AdaptoLean, which comprise of Bitter Orange Peel, Green Coffee, Concentrated Ketones and specific micronutrients involved in fat-loss metabolism and the improvement of insulin function (important for dietary carbohydrate metabolism). 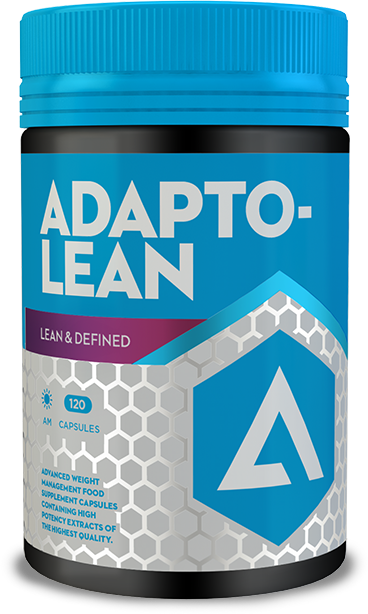 AdaptoLean is a comprehensive weight management system designed to help with your lean body aspirations. Ingredients: In a 2 piece gelatin capsule: Garcinia Cambogia , Caffeine Anhydrous, Cayenne Pepper, Green Tea Extract, Bitter Orange Peel, Barley Extract, Concentrated Ketones, L-Carnitine Tartrate,Green Coffee, Olive Extract, Niacin, Chromium Picolinate, microcrystalline cellulose, magnesium stearate. Other ingredients: May contain traces of milk and nuts. If you have any allergies, food intolerances medical conditions or are taking medication, please consult a healthcare professional before use. Do Not use this product if you feel unwell or if you are pregnant or lactating. Keep away from Children. Store in a cool dry place with the lid firmly sealed. Contains Caffeine. 250mg per serving. Not for tested Athletes. Do not exceed the recommended daily dose. Food Supplements should not be used as a substitute for a balanced varied diet and healthy lifestyle.